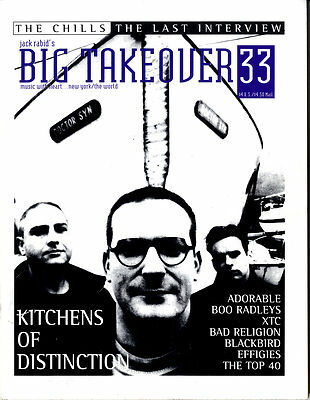 THE Big Takeover Magazine US Rock/punk/grunge back issue #33 1993 with interviews and articles featuring Bad Religion, XTC, The Chills, Effigies, Kitchens Distinction, Adorable, Boo Radleys, Blackbird and Bob Mould Plus other features including lots of LP & singles reviews and Live gig reviews etc. Ex condition - has been stored in a professional binder so very minimal wear. Will be posted in a strong cardboard envelope.